This Georgian-style Summerhouse sets the mood for pleasure and entertainment. It is designed specifically for you to enjoy your garden. With its spaciousness and generous headroom, you can relax in the shade and still be outdoors. Surrender to the spell of warm summer days. 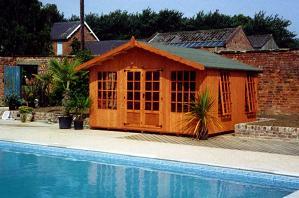 We select only the strongest and best quality timbers, so you can be sure that this is no cheap imitation of quality. The roof, floor and walls are all built in top grade tongued and grooved boarding. The above price include delivery to most areas and are subject to Vat. Assembly service can be quoted on request.